The folks here at Alligator Alley certainly know a thing or two about reptiles, and we enjoy teaching our visitors all about our scaly friends. In honor of Reptile Awareness Day on October 21, we want to share some of our knowledge with our friends. Most reptiles cannot chew their food, they can only tear it with their teeth and claws. Reptiles are often described as being cold-blooded, even though their blood is not cold. Reptiles are Ectothermic, meaning they cannot regulate their body temperatures internally like humans and other mammals do. Reptiles depend on the sun and other forms of warmth to maintain a stable body temperature. When you visit Alligator Alley next time, be on the lookout for alligators basking in the sun! There are over 8,000 species of reptiles on the planet. Reptiles can be found on every continent, aside from Antarctica. And we don’t blame them – it’s too cold! Reptiles are one of the longest living species on the planet. For example, Aldabra tortoises can live for more than 150 years; alligators can live to be 70 years old; and Ball Pythons can live for up to 40 years. If you decide to adopt a reptile as a pet, prepare yourself for a lifetime of commitment! Reptiles are also the oldest animal on the planet. Many reptiles, including turtles and crocodiles, have been on our planet for over 200 million years. Think of them as modern day dinosaurs. Alligators can only be found in the United States and China. 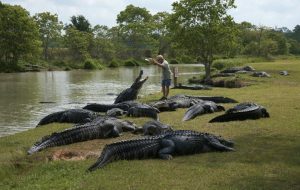 American Alligators, including the 450 alligators here at Alligator Alley, live in the southeast United States. The Chinese Alligator is on the verge of extinction and can only be found in the Yangtze River Valley. In fact, there are more Chinese Alligators living in captivity than in the wild. 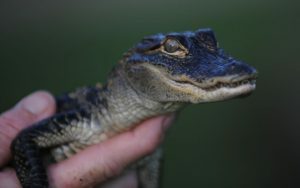 Baby alligators’ gender is determined by temperature. When a mother lays her eggs, the temperature in which the eggs develop will determine the baby’s gender. Eggs exposed to temperatures of 86°F will become female, and eggs exposed to temperatures above 93°F will become male. Most snakes are not harmful to humans. Only about 500 species of snakes are venomous. Of those 500, only 30-40 species harm humans. Additionally there are 200 species of venomous snakes that are medically important. Fortunately, only six of these venomous species reside in Alabama. Most reptiles feed on insects, small animals, or other reptiles. In fact, alligators are known to prey on smaller alligators! Reptiles do not have sweat glands or sebaceous glands so their skin actually remains cool, dry, and waterproof. The next time you visit Alligator Alley, take advantage of the opportunity to hold a baby alligator – you will certainly notice how dry their skin is! We hope you feel more knowledgeable about these amazing creatures! Next time you’re in our area, make plans to visit the farm and meet our scaly friends personally. 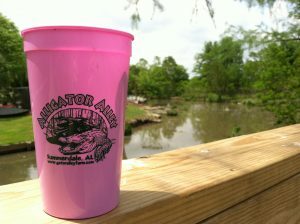 And don’t forget to share your favorite #AlligatorAdventure memory with us on Reptile Awareness Day (Oct. 21)!